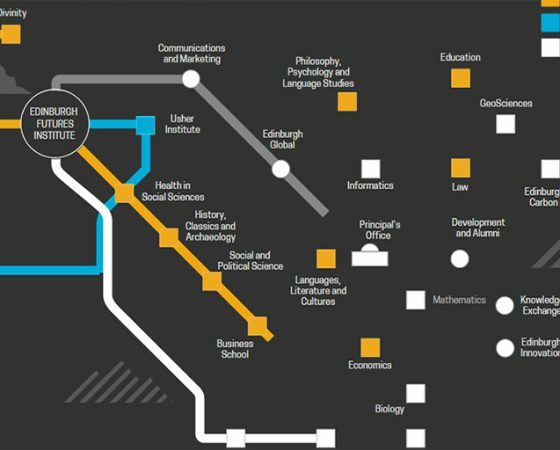 The Edinburgh Futures Institute will be home to a range of world-leading research groups looking at cultural, technological, political, social and managerial challenges. It will provide flexible space for externally-funded groups alongside more permanent research centres that will anchor the Institute’s outputs. The Academy of Government supports new forms of teaching and research in government, politics and public policy and aims at providing policy makers with an understanding of how government happens, how policies are made in the everyday, whether in local, national or international contexts. The Centre is a world-class centre of excellence on infrastructure systems. The CFI combines knowledge and expertise within the University’s expertise in engineering, informatics, architecture, social and political studies and business school. The CFI will host a city and regional infrastructure database at the Edinburgh Parallel Computing Centre that will help researchers and innovators working with city and regional administrators to inform and significantly improve decision-making. With the CFI, Edinburgh and the region can benefit. In this $2.3 trillion annual market worldwide, the potential for spin-out companies and start-ups is massive. Read more about the The Centre for Future Infrastructure (CFI). The IICR was established in 2013 to explore how global cultural interactions in areas such as the arts, education, sports, and political economy can have an impact. Through programmes and research it promotes a better understanding of how to bridge the gap between diverse global cultures when engaging in political and cultural diplomacy. The IICR acts as a catalyst for interdisciplinary scholarship across the whole University and as a bridge to practice. It is committed to expand and deepen connections to academic, decision-maker, policy and practitioner communities across the planet. Edinburgh Global leads the University of Edinburgh’s international strategy and global engagement. It supports and delivers collaborative, strategic projects and initiatives and provides professional services which underpin global partnership, go abroad and exchange, student recruitment, student support and visa advice. As well as the Edinburgh office, Edinburgh Global has regional centres in Mumbai, Beijing, Singapore, Santiago and New York. Our Global Academies cross boundaries in research and teaching, adopting a multi-disciplinary, collaborative response to challenging global issues. The University has five Academies. The Global Health Academy aims to improve global health through collaborative, interdisciplinary research, education and resource development; The Global Development Academy brings together teaching, research and partnerships, making practical and intellectual contributions to international development; The Global Justice Academy supports research, teaching and knowledge exchange on global justice issues; The Global Environment & Society Academy are a network of experts who collaborate on innovative solutions for global environmental challenges; The Global Academy of Agriculture and Food Security works to improve the effectiveness and sustainability of agri-food systems, which is central to many of the UN Sustainable Development Goals.